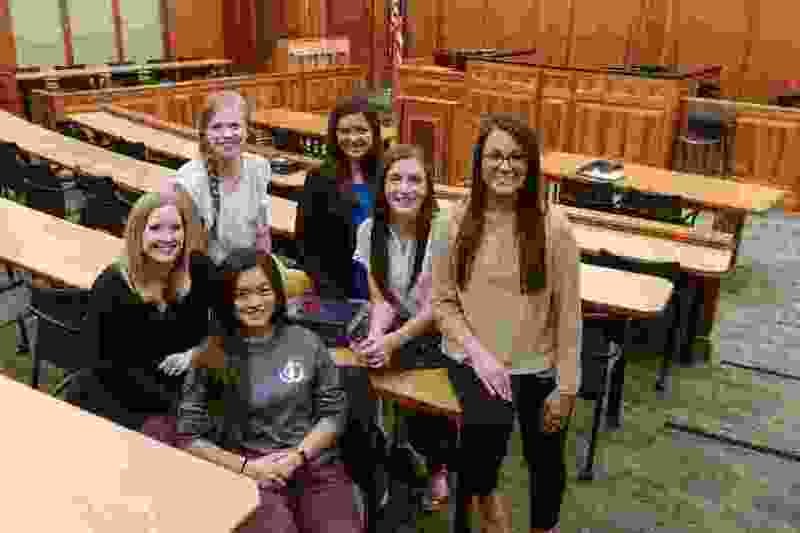 ( Leah Hogsten | The Salt Lake Tribune ) Left to right: Kate Zurcher, Ellen Welch, Kristie Lam, Summer Crockett, McKinney Voss and Daniela Rosbach are first-year law students at Brigham Young University. For the first time in the school's history, BYU's J. Reuben Clark Law School's incoming class has more women than men. For the first time since Brigham Young University’s J. Reuben Clark Law School opened its doors in 1973, the incoming class has more women than men. The numbers this year don't show a big difference between the genders — there are 54 women and 50 men. But a class that’s 52 percent female marks a considerable change at the Provo school that’s owned and operated by The Church of Jesus Christ of Latter-day Saints. From 1995 to 2017, that number averaged 36 percent, peaking at 43 percent in 2014. It’s a significant milestone at a law school that wasn’t always welcoming to women. “My mom actually went to BYU Law School [in the 1970s], and definitely had professors who told her — how dare she be there and taking the place of a man who needed to put food on the table,” said Alexandra Sandvik, a 2016 graduate and former president of BYU Women in Law. “All I can say is, it's not your mother's law school anymore,” BYU Law School Dean of Admissions Stacie Stewart said with a laugh. BYU Law’s first class included just 10 women out of 147 students — 7 percent. When Stewart entered BYU’s law school in 2011, that number was 38 percent. She asked the then-dean about that and was told it was because the school didn’t receive applications from qualified women. “I rolled my eyes and said, ‘Yeah, yeah. Whatever,’” she said. “And when I became the dean of admissions in January, and I looked at our historical numbers and, yeah, we don’t get enough qualified female applicants. Applications from women were up 20.7 from 2017, and 28.5 percent from 2016 — for reasons that Stewart can't explain. The theories range from some sort of reaction to the Trump presidency to “a wave of women returned [LDS] missionaries,” because “a lot of them … wrote about their missionary experiences” in the applications. 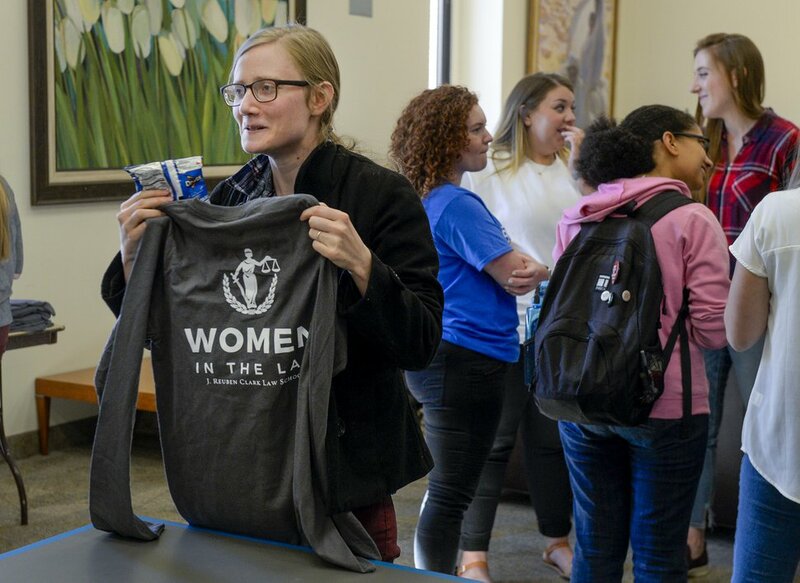 ( Leah Hogsten | The Salt Lake Tribune ) Brigham Young University first-year law student Alizabeth Worley of Lindon sizes up her free T-shirt from the "Women in Law" club at a social mixer on campus, September 20, 2018. For the first time in the school's history, BYU's incoming law school class has more women than men. The days of BYU professors questioning why women are in law school have long since passed. Gough said she received great encouragement from one professor when she approached him about applying after she’s been a stay-at-home mom for 14 years. “He was very excited and said, ‘Oh, we need good women here,’” she said. Leah Aston, another member of the class of 2016 who had a “very positive experience” at the school, said it was “fantastic” to hear that the incoming class is majority female. Nationally, 51 percent of law students are women, according to the American Bar Association. The University of Utah admitted its first majority women class in 1992 — 51 percent, the same percentage as the most recent graduating class, according to associate dean Reyes Aguilar. Currently, 43 percent of its law students are female; the class of 2021 — admitted this fall — is 40 percent female. But current and former female BYU law students said some of their classmates still occasionally show 19th-century attitudes. Will women remain a majority? Stewart isn’t making any predictions.